Take part in an ancient Aztec ceremony led by an authentic shaman in a ‘temazcal’ — translated as ‘home of hot stones.’ A source of revitalizing energy and health, this cleansing ritual uses volcanic stones and aromatic herbs to help you pass through four stages of purification. Afterward, relax in a hammock and refresh with tropical fruits. Ride a motorboat on Coyuca Lagoon during this nature-lover's tour of Acapulco. You’ll discover native flora of the freshwater lagoon, such as water hyacinths and tropical palms, all pointed out by a knowledgeable guide. Learn to delicately handle a baby turtle that you can ‘adopt’ and release safely into the sea. Then enjoy lunch and domestic drinks at a restaurant on on the beach where you will have time to take a stroll, relax in a hammock and watch the time go by. 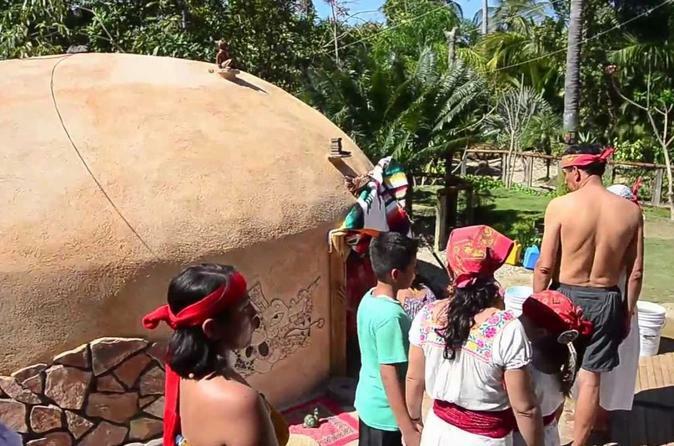 You’re transferred to the sweat lodge where your ceremony takes place with a small group. If you opt for a personalized experience with your private party, your tour includes round-trip transport from your hotel. Begin around the fire with an introductory talk from the ‘temazcalero,’ a shaman who will guide you through the Aztec purification ritual. Enter the temazcal and feel the heat of volcanic stones in the darkness. Aromatic herbs and resin from the copal tree, commonly used to relieve symptoms and ailments, help put you at ease and cleanse the body of negative energy. Using mud, honey, aloe vera and refreshing teas, you’re guided through four intervals of increasing and decreasing heat accompanied by songs and musical instruments to restore curative powers. Once you are picked up from your hotel you will enjoy a cliff-side ride along the beautiful coast to the Coyuca Lagoon, one of the most picturesque and colorful places in Acapulco. This beautiful fresh water lagoon is considered to be one of the most important natural attractions of Acapulco. Thick palms, water hyacinths and native flora & fauna, are only a few of the attractions found in this beautiful Lagoon. This tour is a great combination of a fresh water lagoon and incredible sights. Get your camera ready for some fun tropical snaps of you and the beautiful natural flora that characterizes this awesome Acapulco attraction. When your air conditioned van arrives at the heart of the lagoon you will transfer to a small typical boat to cruise through the thick vegetation. A paradise for flora and fauna, this tour is a must for nature lovers. Explore the area on board an exciting boat and discover the green dense vegetation surrounding it. Enjoy a cruise along the Coyuca Lagoon, one of the most picturesque and colorful parts of Acapulco. This area is famous for its tropical vegetation and has been the location for many Hollywood movies including Sylvester Stallone's Rambo II and The African Queen. Enjoy lunch and drinks in one of the world's most relaxing settings. You will visit a local beachfront restaurant where you will enjoy typical lunch and domestic drinks. After lunch you can walk along the beach or just relax in a hammock. After lunch take a walk on the beach or enjoy the ocean breeze as you sit back and relax.